The great constellation of Orion at 50mm, HaRGB. 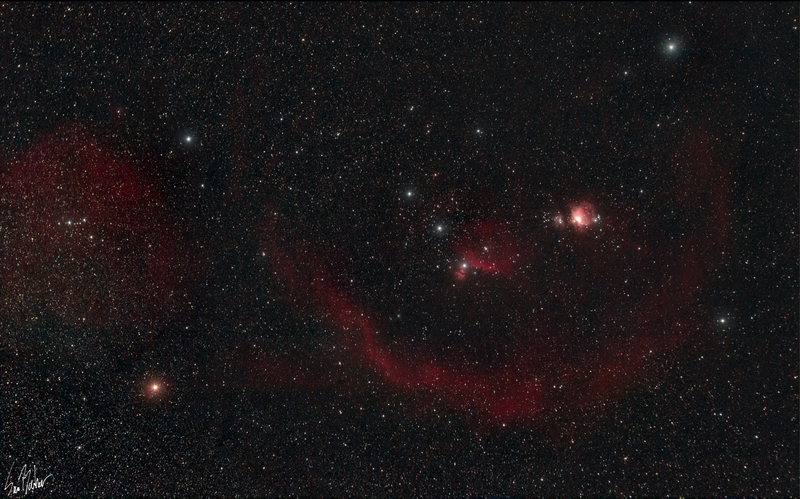 Most of the Orion molecular cloud is seen here (at least the active stuff), including Barnard’s loop and Sh2-264 (the bubble on the left hand side). The horsehead is shown at the bottom of the belt and of course the Orion nebula shines as the sword. Red is hydrogen emission here, and as you can see it dominates most of the frame. This is a little noisy, but I didn’t have as much data as I wanted here.